Have you heard of using facial exercises to keep your face looking young? Here's some information about them, including why you might want to think twice before you start. Every facial expression depends on tiny muscles below the skin. Each smile, each frown, each look of surprise or sadness is created by the contraction or relaxation of these muscles. In a healthy person, it's rare that facial muscles will become truly weak. After all, the muscles get used many times every day. However, some experts think that adding extra exercise can help give facial muscles extra tone. The idea is that stronger muscles will firm up the chin, make the cheekbones more prominent, and generally make the face look younger and better. Does it really work? You won't find the answer in the medical literature. Some people swear by facial exercise, but others say that it doesn't work at all. If you'd like to give it a try, you'll find instructions for some exercises at the end of this article. One sure way to make your face look better is whole-body exercise. When your whole body is in better shape, your face will look better, too. Whole-body exercise will reduce your percentage of body fat. That, in turn, will help eliminate a double chin and make cheekbones stand out. Being in good shape will also lend a glow to your face and make you feel better all over. Facial exercises may be good for the muscles, but they won't improve your skin. The reason has to do with how the muscles and skin interact. Many of the muscles of the face attach underneath the skin. Each time you use one of these muscles, it tugs on the skin. These little tugs and pulls change the skin's shape and create facial expressions. Young skin bounces back quickly after each smile, frown, or other expression, but older skin is less elastic. Each tug from a muscle stretches the skin just a little bit, and older skin can't bounce back. So the movements of facial muscles can actually add to lines and wrinkles. 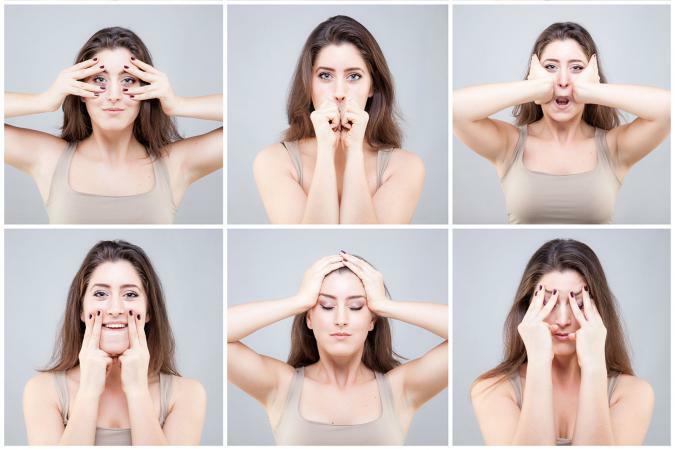 Facial exercises involve repetitive movements. That means the skin stretches in the same place, and in the same way, each time the exercise is repeated. Instead of making skin look younger, the repeated movements can create new lines or deepen existing ones. Some people truly need to do facial exercises. After a stroke, the muscles on one side of the face may not work properly. That's because the brain is no longer sending the correct signals to tell the muscles to move. Just like muscles in other parts of the body, facial muscles will weaken and atrophy if they're not used. Doing facial exercises after a stroke can help re-train the brain and make muscles strong again. A condition called Bell's Palsy can also make facial muscles weak. In Bell's Palsy, a viral infection paralyzes the nerves on one side of the face. Until the nerves recover, the muscles won't move, so they become weak. Exercises may be needed to help the muscles return to normal. Here are some facial exercises recommended by beauty web sites. Books are available with more detailed instructions; you'll find several at Amazon.com. But remember, there's no guarantee these exercises will make a difference! Eyes. Place fingers at the corners of eyes. Move your fingers up while using your facial muscles to move your eyelids down. Next, place index fingers above eyebrows. Pull down gently with your fingers while trying to raise your eyebrows. Repeat 10 times. Mouth. Purse your lips, then smile widely. Repeat 10 times. Chin. Place two fingers underneath your chin and press in gently. At the same time, press your tongue against the inside of your bottom teeth. Hold for 10 or 15 seconds.